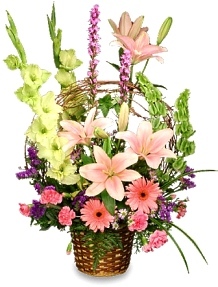 Since 1996, New Beginnings has maintained an exceptional reputation for floral design and professional customer service. We are staffed with qualified designers who can customize any bouquet whether your personality is drawn to the traditional, the dramatic, the natural, the romantic, or the contemporary. With locations in Alvin and Santa Fe, we can serve all your floral and gift giving needs. We offer daily deliveries to Clear Lake Regional Hospital, St. Johns Hospital, and South East Memorial Hospital. We also serve Oak Park, South Park, Crowder, Forest Park East, Jack Rowe, Palms and Jutus Funeral homes. We are also just a block away from the Froberg’s Funeral Home. Not only can we fill your every floral need, we also have a extensive line of gift items for all ages and all occasions. New Beginnings has a wedding consultant who can help you to plan your special event whether you desire a small intimate wedding or the social event of the season.